We hope that you come back often to see what is going on around our ranch! 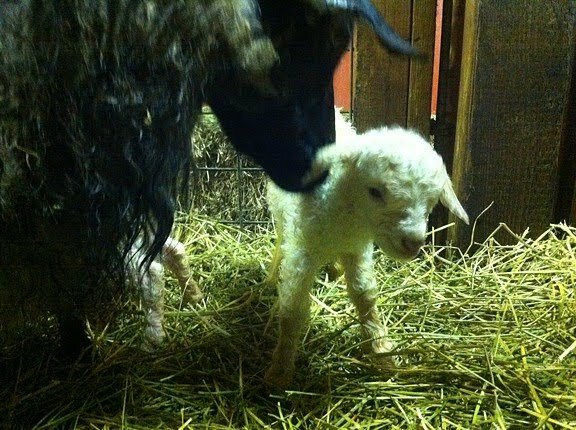 Our 2012 Kidding season is about to begin! 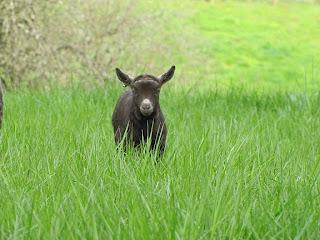 Our 2012 Kidding season is almost here! 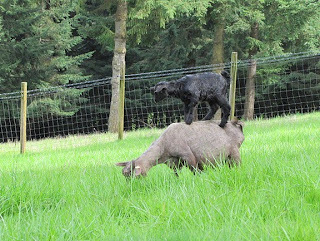 The momma goats are getting bigger by the day. Our very first kids could arrive as soon as March 23th (145 days gestation) if they got bred the first day they were put in with their assigned buck. Typically they arrive at 147-152 days gestation. Our major kidding will continue on through the month of April. As you can imagine, it will be a busy time on the farm very soon. We have been busy preparing for our first arrivals. All of our Does received their annual CDT booster so the babies will be protected at birth. The kids will then receive their first CDT vaccine at 4-6 weeks of age, a booster 2 weeks later and then their last booster 4 weeks after that. By that time it should be just about weaning time! -We condition scored our Does and they are looking fat and happy. We did sorted out 4 of our older girls that we felt needed a little more tlc and put them on a richer protein diet. -We recently replaced some of our old barn lights in our kidding area. I’m so excited to have reliable lighting this year! -Our kidding supply bags are all put together and ready to go. -Kidding supplies ordered and received. -We will be hauling hay tomorrow and filling up our barn so it’s well stocked throughout kidding season. -Our “clip, dip and strip” supply tote put together. Every Wednesday is dedicated as our "Herd health day". This is where we round up the goats and have a list of various items that need to be taken care of. This Wednesday, we will be rounding up all the kids. We plan on taking updated photos and descriptions of about 30 kids. We will be checking heads for scurs and redisbudding if needed. It's best to catch scurs now as they are still small and easy to remove. Once this is done, we will be rounding our few sheep friends as it's time for them to be sheared. After that, the time will be spent doing a list of chores around the farm. Everything from washing buckets, to moving plywood to the hay barn. It will be a very busy day. Our Pygora kids at Play! I’m happy to announce that our 2011 Hawks Mtn Ranch Pygora kid list is now complete and I have e-mailed it to the first 3 people on our deposit list this evening. Once the first person has picked their kids, then I will send the list to the 4th person to view and so on. Once everyone on our pre-deposit list has picked their kids, then our list will go public. It's not too late to still get on our deposit list. Momma goat with kid on board! Today as I was turning the momma and baby goats out to the lower pasture for the first time, I decided to take my camera with me. I couldn't believe what I saw. This mom was actually walking around with her baby "on board". What a good momma! It’s been a super busy time at the ranch! It’s amazing how quickly time is flying by! Kidding started exactly 1 month ago on 3/14. Since then, 134 Pygora kids have been born here! We only have 3 more Does left to kid. 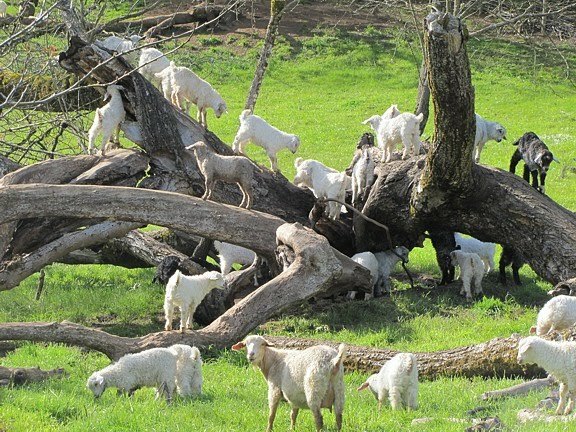 We have a very colorful herd of bouncing baby goats and all fleece types too! This week, I spent writing descriptions for all of the kids for our kids list. As each kid was handled and critiqued, I was really impressed with the quality of kids we have this year! I have photos of all the kids now and I've been busy cropping them down to a size for easy and quick viewing on the internet. I will be spending a lot of time at the computer over the next several days. My plan is to spend most of my time putting all the pieces together for our kid list. I can't give an exact date when my list will be available as I have a lot to do out in the barn still but I will give an update when I have it ready for our pre-depositors. Thanks everyone for your patience and if you have any questions, please feel free to contact me. I can be reached via e-mail, facebook, text or phone at: 503-539-0295. Please leave a message and I will get back to you as soon as I can. 120 kids on the ground so far with 19 more Does still left to kid. Busy, busy, busy taking photos for our Pygora kids list. Once kids are born, they are brought into the barn with their mom and put in their own private kidding pens. They are in these pens for 2-3 days so they can bond together and to make sure babies are doing well and mom has enough milk for them. Also during this time, the kids navels will be dipped in iodine to help prevent infection, moms teats will be stripped to make sure the waxy plug is removed and milk is coming out. We also give each kid a selenium and vitamin E shot. We take a photo of each kid at this time and they are given a temporary farm eartag for identification. All moms are given a wormer and are hoof trimmed. Once everything is checked off, then the moms and kids are turned out into our nursery area with other moms and kids. While in the nursery area, all kids will be tattooed with their own unique identification number, disbudded and band (neuter) boys. We will also do our "3T's" check. The "3T's" are; "Teeth", Teats, and Testicles". We do the "3T's" check to ensure our kids qualify for our breeding stock standards. We want to make sure the mouth is aligned properly, they have 2 teats, and that the boys have 2 testicles. The "3T's" is an ongoing process as the kids get older too. Once everything is checked off, the kids and moms then leave the nursery area and are turned out to pasture and it's play, play, play time for the babies as they investigate their new surroundings. It's my favorite time of year watching the kids take off leaping, hopping and skipping down our hilly green pastures. Inbetween everything that is going on, I will be working on putting together my Pygora kids list. I have been taking photos of each kid before they are turned out to the nursery area. I still need to take photos and get descriptions for them. I'm hoping to catch some sleep in there somewhere! Feel free to contact me. I can be reached via e-mail, text (503-539-0295 or facebook or phone. Please leave a message if you can and I will get back to you as soon as I can. 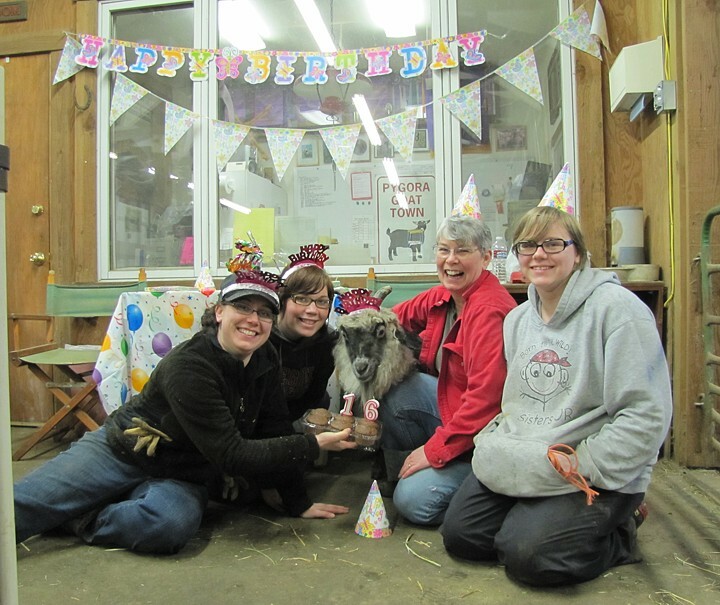 Happy Sweet 16 Birthday, Sitka! We all took a time out yesterday from the fluffy of baby goats to celebrate Sitka's 16th Birthday. Sitka enjoy her bran muffin birthday cupcakes. Kidding season is in full swing! We had 31 kids born yesterday for a total of 69 kids so far. A HUGE THANK YOU to Julie, Jessie, Morgan, and Erika for all the help yesterday. By the end of the evening, all 31 kids and mommas were happily tucked away in their pens. Our 1st 2011 Pygora kids have arrived! During my night time barn check last night, I was surprised by tiny little squeeky noises coming from the back of the barn. 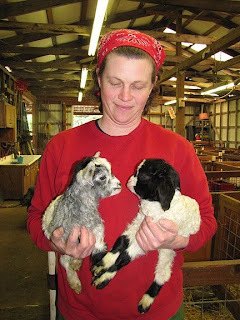 It was our Pygora goat, Fudgesicle,with 2 very curly twin boys! Fudgesicle is the first Doe to kid on our farm this year. She has been the first on to kid 3 times in the last 5 years.That’s all for now. Check out our website or facebook page as I will be giving updates along the way. 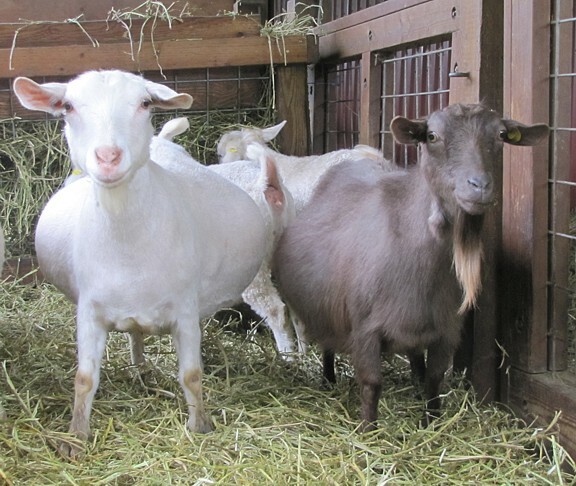 Visit our Pygora Goat website!